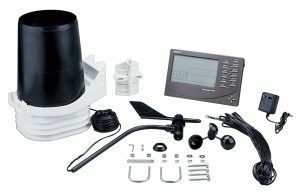 One of the popular high-quality weather stations available in the market is Vantage Pro2 Cabled. This is a multipurpose weather station that is a combination of a rain gauge, hygrometer, and thermometer. The sensors are enclosed in a standard radiation shield that helps improve theaccuracy of the data generated. This weather station is made up of 2 modules that are a console and an integrated sensor unit. The device is powered by an AC adapter. It comes with mounting hardware that makes it simple to install and start using it. This weather station is composed of 2 modules namely the integrated sensor unit and the console. The sensor unit is composed of different sensor namely thermometer, hygrometer, rain gauge and anemometer that is fitted with a cable that is 12-meter long. A 100ft cable connects this sensor unit and it can transmit data to adistance of up to 1000ft. A standard radiation shield protects the temperature and humidity sensors against extreme and unnecessary heat and radiation so as to provide accurate data and forecast. This unit is powered by a solar panel. This is thepoint of interaction between the user and the sensor unit. It has a display with dimensions of 5.94 inches by 3.375 inches that also includes a keyboard that is easy to use. The display uses weather icons to show the various weather conditions such as rainy, cloudy, windy, humidity level and also moon phases. It also displays time and date. Weather aspects such as temperature, humidity, wind direction and speed, atmospheric pressure, and rainfall are updated at an interval of 2.5 seconds. This console archives weather data and enable comparison and analysis at a later date. In addition, the console enables viewing of other data such as UV radiation, evapotranspiration, dew point, heat index among others. This console also comes with an indoor temperature, barometric pressure, and hygrometer sensors. These sensors give indoor temperature, humidity, and a barometric pressure. It also allows one to a WeatherLink data logger and a virtual weather station internet version. With this feature, you can connect the console to a computer or even a weather exchange website. Using the adapter that comes together with aweather station, you can charge this console. This weather station has a number of advantages as well as disadvantages. This is a unique weather station that is cables and has the capability for data logging. It also incorporates a virtual weather station app and it makes it be one of the popular weather stations available in the market. This app enables connection to the internet and which in turn enables free connection to Weather exchange website. From here, one can compared data with other stations. Since this station is cabled, then it can still be used even in extreme weather conditions and also ensures theaccuracy of the reports generated. The unit is also has a cover to that can withstand harsh weather conditions. This means that even in disastrous weather conditions, this weather station will still be functional. Evens if Vantage Pro2 Cabled is a High-quality weather station, it still has some shortcomings. The cabling of this station makes it a little bit difficult to install. This is because it has to be properly mounted on the wall to avoid interference. The mounting of the sensor unit if not done properly can later affect theaccuracy of data from the various sensors. This weather station requires aninternet connection in order –to connect with Weather exchange website. Without aninternet connection, posting of live data might not possible. This high-quality weather station might not be affordable for an average budget individual. Due to its high-end features, it will cost a little more compared to other weather station available in the market. Vantage Pro2 cabled is a high-end weather station that can withstand extreme weather conditions and still give accurate data. This is, therefore, an ideal choice for those people who want to get a reliable and accurate weather station. It makes it possible to share weather information with others and also gives one the privilege of enjoys the various trends that the weather station provides. Though this weather station is expensive, it serves it purpose and its features suit its price.